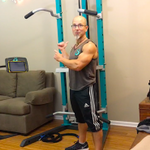 This is an excellent upper-body session, with a primary focus on the chest and back muscles. If going through this session once is "easy" then go through it a second time (as I instruct on the specifics in the video). And as I mention in the video, this session can be combined with other sessions, depending on what you're aiming to achieve with this session as a whole, and/or the specific day you're doing it.